I’m going to start off here by saying that I’ve been very lucky. 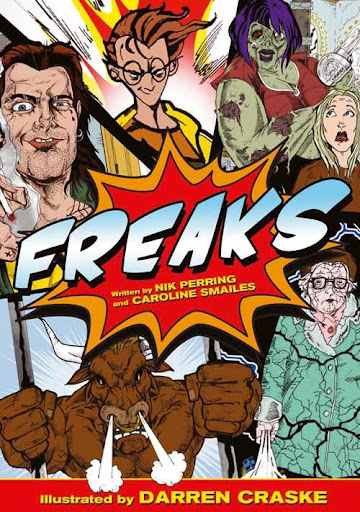 I’ve had three books published and two of those have been short story collections (Not So Perfect was published by Roast books in 2010, and Freaks!, a collaboration with Caroline Smailes was published by The Friday Project (HarperCollins) a couple of weeks ago). And in a culture where (commercially, at least) the novel is king, I know that that makes me very lucky. I never set out to be a short story writer. I started life as a writer about ten years ago by writing things for newspapers and magazines. Then, in 2006, my children’s book came out. All the way through I’d been writing short stories, and I’d had a bunch of them published, but I’d not considered myself a short story writer. I was just a writer who wrote short stories. And I wrote them because I enjoyed writing them. Same as reading them. As time went on I wrote more and more short stories. I found the form suited me and the stories I wanted to tell, or maybe I suited the form. Either way, that’s what I did. And again, they were published and I was fortunate to have a collection out with the magnificent Roast Books in 2010, and then with equally magnificent The Friday Project this year. So, while I wouldn’t say that I fell into short story writing, or that it was a happy accident, it wasn’t anything that I’d planned. It happened as it should have happened and that’s cool. So how do I survive as a short story writer (a label which I’m getting more and more comfortable with) in a world where, commercially at least, it’s the the novel that’s king? I think the answer’s surprisingly easy: I survive writing short stories because that’s what I do, and that’s what I love, and I firmly believe that if you do something well, and if you work hard at it (any writing’s hard, not just one form) and if you get that bit of luck, then you can do okay at it. Don’t forget, people like good stories. Editors and publishers like good stories and readers like good stories. And that’s regardless of their length. Some stories are always going to be longer than others (novels), but if they’re good, they’re good, and that means they’ll have a great chance of finding a home and an audience. Commercially, short story collections don’t sell as well as novels. We know this. Twas ever thus. And that’s not a problem (it is a Good Thing that people buy stories of any length). Nor is it the whole picture. Not every novel sells by the truck load, and not every novel reader will buy every sort of novel. And most novelists don’t make a fortune. They do what they do because they enjoy it, because they’re good at it and because the novel, as a form, suits the stories they want to tell. And they make some money from it. They probably have to do other things too to keep that financial wolf from the door, like editing or teaching or running workshops – or even jobs that have bugger all to do with writing. And that isn’t all that different to us short story people. We do it for the same reasons. We’re all writers. There shouldn’t be any us and them, or any prejudice because, really, we’re doing pretty much the same thing. So, how do I make it as a short story writer? Simple. I do what I love doing and I do it as well as I can. Thanks, Nik, that’s a lovely, encouraging message actually – write what you love and do it well. I wish you every success. if I don’t say a word. and them lasses will leave me alone. Previous Post Don’t be a twunt. "Don’t forget, people like good stories. Editors and publishers like good stories and readers like good stories. And that’s regardless of their length. "Absolutely true – though it's easy to think a short story has to be between 2 – 3,000 words judging by some zines/journals/comps. I love writing short stories – some have been tiny and some have been 10,000 words+. Just write them well and enjoy is much the best advice. Thanks Nik, and Sara.